As the Texas Legislature’s special legislative session carries into week two, Texas Competes members across the state are voicing concern that legislation targeting transgender Texans will drive away tourism and talent from the state and ultimately harm their bottom line. We’ve seen economic harm in Indiana and North Carolina, resulting from anti-LGBT discrimination. Today, we’re seeing that same harm already unfolding in Texas. 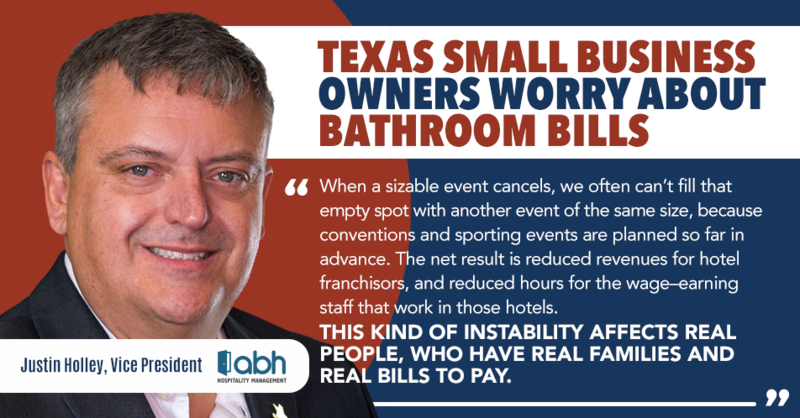 Last week, tourism executives announced that the ongoing bathroom bill conversation has already resulted in event cancellations totaling more than $66 million in direct impact. A further $1.36 billion is on the line in sporting events and meetings whose organizers have said they may cancel if a bathroom bill passes. We know that these losses would result in the loss of tens of millions of dollars in state revenue. What we don’t often hear about these massive numbers is how they impact small businesses and the people they employ. From corporate investments and relocations to tourism and sports, small businesses are at the heart of the fates and fortunes of the Texas economy. Good morning. I’m Maryanne Guido of Guido Companies, a construction and commercial building materials company in San Antonio. We are a four-generation, family-owned business that has been operating in Texas for 90 years. We are proud to be part of the growth of San Antonio, as it emerges as a leading city in Texas and in the U.S.
We have colleagues in the construction business in Charlotte, Raleigh, and Durham, North Carolina who tell us that their bathroom bill debacle has been an absolute disaster for their economy and for their businesses. Even the recent repeal and modification of the original bathroom bill has hurt tourism and investment in business there. 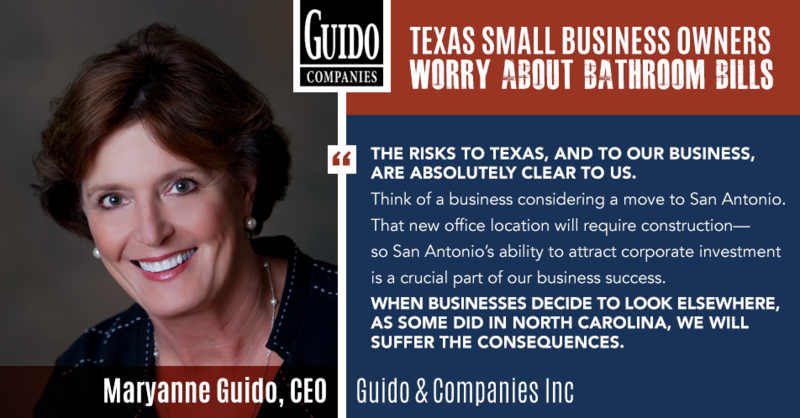 The risks to Texas, and to our business, are absolutely clear to us. Think of a business considering a move to San Antonio. That new office location will require construction – so San Antonio’s ability to attract corporate investment is a crucial part of our business success. When businesses decide to look elsewhere, as some did in North Carolina, we will suffer the consequences. When tourism falters, as we know is already happening, investments in convention centers, hotels, and other venues suffer – and our business along with them. These risks have human costs. The people who work for us, who rely on steady work to feed their families and make their rent or pay their mortgage – they will suffer too. We’d like to get on with the business of keeping Texas welcoming, vibrant, and growing – and that means putting an end to this manufactured conversation about restrooms. Good morning. Red Velvet Events has been planning unique, unforgettable events in Austin and around the world since 2002. We do destination management for event, meeting, and conference planning, connecting organizations and their attendees with scores of local businesses, including entertainment, tours, transportation, decor providers, restaurants, and more. We do event production, bringing in local vendors for catering, signage and printing, entertainment, speakers, performances, and audio-visual. Our work every single day brings us into contact with small businesses and self-employed Texans who put in long hours to make their businesses successful. They depend on a thriving Austin tourism economy to continue to thrive themselves. When we see tourists vote with their feet, it’s *these* small businesses and individuals who will suffer first. It’s the caterer who loses a big job, and has to lay off a chef or server. It’s the audio-visual technician who can’t balance the family budget because her hours were cut this month. It’s the entertainers and drivers, the decorators and sign-makers who see revenues drop, and who don’t have a way to quickly fill that gap. There’s a lot of rhetoric about keeping people safe right now in Texas. But there’s no evidence that anyone is in any special danger in our bathrooms. We are here, however, with clear evidence that our small business owners and our hard-working folks in the tourism industry ARE at REAL risk. We’d like to think that the folks up the road in Austin, who talk so much about small businesses in Texas, will work to protect them, and the families who rely on them, from unnecessary economic harm. My name is Amber Briggle and I’m the owner of Soma Massage Therapy in Denton, Texas. Y’all might recognize my name – my 9-year-old son, Max, is transgender, and I’ve been vocal in support of him and his rights. But I’m not here to talk about Max today. See, this thing is hitting my family from two directions, because our family budget relies on my income as a small business owner. My business employs 12 people, and starting pay is $35/hour. These are great jobs with great hours and great pay. Denton is a college town, so we’re already very concerned about the impacts that the California travel prohibition will have – on sports, and on meetings and conventions. Add this bathroom bill stuff to the pile, and small businesses here in town are worried. My business relies on a strong flow of visitors to Denton as part of our business model. People come here for work or for play, and they get massages. Business has been great – in fact, with the completion of the Denton Convention Center, I’ve been considering adding additional staff solely dedicated to providing on-site services to attendees of events there. But now – and as long as this manufactured bathroom debate rages on – I have to wait. If I can’t rely on tourism traffic – and all of the data and examples suggest that I can’t rely on it, if we keep doing this bathroom thing – then I can’t take the risk of investing in expanding my business. That’s what this looks like, in real time, and on the ground. It seems like small business owners have been forgotten in this whole thing. We’re great for talking points about being the heart and soul of Texas…but when we stand up to say that our businesses are in jeopardy, those same folks don’t seem to listen. I hope they hear us now. ABH Hotels manages seven properties across San Antonio, Temple, Corpus Christi, and Austin. The people who work in these hotels are real people: they’re managers, chefs, and housekeepers. They rely on the hotel traffic that provides them with steady working hours – and a steady income. Here in San Antonio, we already have 43,623 hotel nights on the line over the coming years, from actual and threatened convention cancellations. Every single cancellation will directly impact the small businesses – like our local hotels – that rely on a strong tourism economy to make ends meet. When a sizable event cancels, we often can’t fill that empty spot with another event of the same size, because conventions and sporting events are planned so far in advance. The net result is reduced revenues for hotel franchisors, and reduced hours for the wage-earning staff that work in those hotels. This kind of instability affects real people, who have real families and real bills to pay. The push to single out a small and vulnerable minority is frustrating to us in the hospitality industry. We’re all about welcoming people, and this sends the message that, as a state, we pick and choose whom to welcome warmly to Texas. I’m Jason Bodor, Co-Founder & Senior Director of Business Services, for GSATI, an award-winning web application development company specializing in the direct sales industry. services firm. We employ 27 people here in Texas. Denton is known for its creative culture, but it’s also home to an emerging startup and technology sector. We have a vibrant Startup Weekend, meetups and hackathons, and a thriving tech culture. Our local universities help feed our culture with programs such as UNT’s Innovation Greenhouse which produces world-class students and graduates with entrepreneurial skills. We need those folks to stay here. Attracting the best talent isn’t optional for us; it’s crucial to our competitive edge and our business success, because our people are our product. Denton is home to a lot of technical talent – people who are drawn to our sense of community and our quality of life. If Texas continues down the path of leading the country in discrimination against LGBT people, we know our talent pipeline will slow. We know people will move out of state, and others won’t be willing to come to Texas either. Because no matter how welcoming Denton is, no matter how welcoming our corporate culture is, we can’t overcome the stigma that the state of Texas is creating. Additionally, we frequently have clients fly in for planning sessions and system discussions, and we have concerns about the willingness of our global clients to travel to Texas. Finally, as Marketing Chair on the Board of the Denton Mainstreet Association. I am acutely aware that in the event of a major event cancellation in our soon-to-open convention center will negatively impact all kinds of small businesses here in Denton. The pursuit of discrimination will drive away tourists and talented people from all walks of life, and with them, the continuation of our vibrant downtown community. We need to continue providing the southern hospitality Texas has been known for, and be a welcoming place for people from all walks of life. Hello, I’m Tony Moline, CEO of the Cedar Park Chamber of Commerce. We have been the voice of the business community in Cedar Park since 1973, ensuring a strong and dynamic business community for western Williamson County. Our hundreds of members are comprised mainly of the small businesses that make up the fabric of our community. And these employers rely on a highly-educated labor pool and a growing regional economy in order to be successful. We’ve followed this conversation closely, and we have yet to see a shred of evidence that bathroom access is a public safety or privacy risk.